If you’re searching for a new home across metro Atlanta, mark your calendars now for the Parade of Homes! This free, self-guided event is happening over three weekends – April 27-28, May 4-5 and May 11-12, from 10 a.m. to 6 p.m. each day. The easiest way to find out which homes you want to visit and how to get there is by download the official #ATLHomesParade app, available for both iPhone and Android. Upon downloading the app, you’ll notice that everything you need is right there on the home page. View homes based on location using the map, or see every home on this year’s Parade with the ‘All Homes’ button. When you click on a home directly from the map or from the listing on the ‘All Homes’ page, you can easily click the address to get directions and be on the way to the home of your dreams in no time! This year’s Parade app also lets you see all of the homes divided by size. There’s even a calendar that lets you add the Parade dates directly to your phone’s calendar so you don’t miss a day of the fun! Finally, check out the products and services page to see all types of home-related services you may need, or click ‘Share’ to send the app and share the Parade with your personal contacts and social channels. 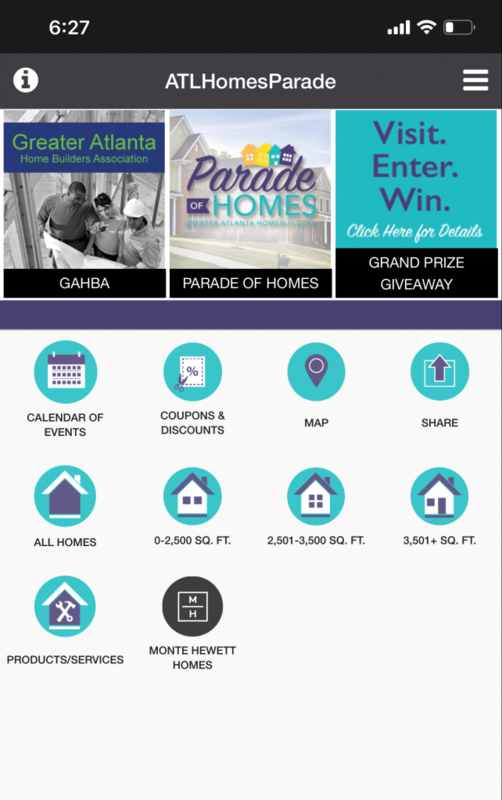 As a Parade attendee, you will have access to this amazingly convenient app but also have the opportunity to visit 40 homes with the latest home features, interior appointments and exterior designs in the metro Atlanta area. Plus, you’ll have the opportunity to enter to win some amazing prizes! The ultimate grand prize, courtesy of Haven Design Works, features an outdoor dining set in a neutral sunbrella linen fabric worth $9,500! A set of colorful beach cruiser bikes from Regions Mortgage will also be given away. You can enter at each model home you visit, and while you’re there, don’t forget to rate the home. Your vote will determine our first-ever Parade award winners! By presenting a wide variety of price points, home styles and communities through the course of three weekends, attendees are sure to get a clear vision of what they are looking for. Each builder will have available home sites and option pricing, so home buyers can choose what is most important for their new home. Intown townhomes, homes for vertical living, suburban home styles, single-family detached homes, active adult ranch homes and even luxury custom homes are available to tour during the Atlanta Homes Parade. Get instant access to floor plans, photos and detailed driving directions by downloading the free mobile app for this exciting event at www.atlhomesparade.com or on the iPhone app store or Android Market by searching ATLHomesParade. For any builders that’ll want to standout during Parade of Homes, be considered to place the Husqvarna Automower at your show home. Email: Automowersolutions@Husvqvarnagroup.com.